As many of our parish priests can attest to Holy Week marks one of the busiest times of the year -- and of course this is no different for the Bishop of Rome. Tomorrow, March 25th, marks the beginning of a number of major events that Pope Benedict is participating in, including a meeting with youth, Palm Sunday Mass, a Mass in memory of Venerable John Paul II and of course the Easter Triduum. Holy Week, which for Christians is the most important week of the year, gives us the opportunity to immerse ourselves in the central events of the Redemption, to relive the Paschal Mystery, the great Mystery of faith. We invite you to enter into more fully into this important week by following the liturgies participated in, and words spoken by, our Holy Father. 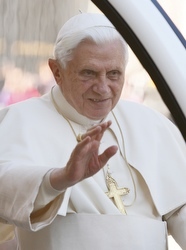 Be sure to regularly check our Papal Events page for the broadcast dates and times of Pope Benedict's activities through Easter Sunday.